The Simpsons (Classic): "Crepes of Wrath"
It is a testament to the brilliance of “Crepes of Wrath”, today’s classic episode of The Simpsons, that the b-story that I remembered only fuzzily is arguably as genius as the justly beloved A story and might just be on the of the funniest, most ingenious elements of the entire first season. Yes, before the Simpsons could go to Delaware one of their kind had to leave whatever their home state is for what I believe is the first time when Principal Skinner visits the Simpson home following one of Bart’s signature pranks and solemnly announces of Bart’s behavior, “We have transcended incorrigible” and announces a drastic scheme to curtail Bart’s shenanigoats: deportation. Well, not full on deportation necessarily but something similar: pawning Bart off on a foreign family as part of the Foreign Exchange program and getting back an apple-cheeked, fresh-faced little angel in return. The episode begins on familiar ground with a vintage Homer pratfall down the stairs and an extended tragicomic sequence of Homer lying on the ground in agonizing pain while Santa’s Little Helper cozies up to him on the floor. We then segue from one Simpson perennial (Homer fall down, make funny) to another when Bart uses a firecracker to wreak havoc in the girl’s bathroom and give Seymour’s mother an unfortunate shock. 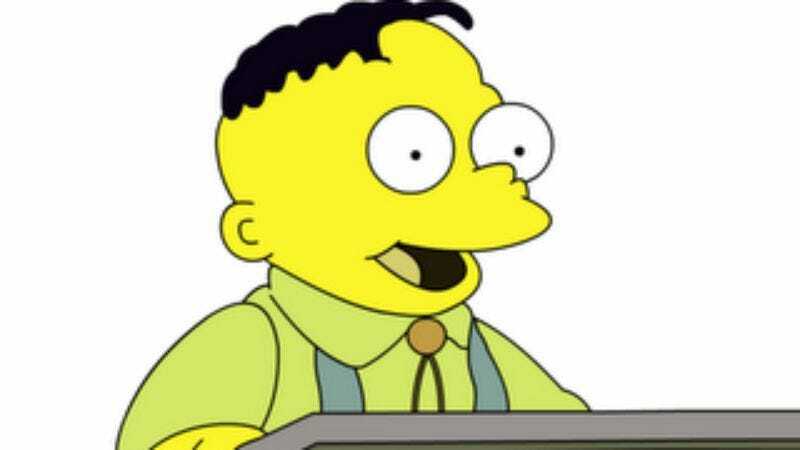 “What I can say?” Bart enthuses mischievously, “I’ve got a weakness for the classics.” Seymour’s mother was incongruously nice, or at least not-horrible today. In later seasons she would castrate Seymour with each acidic word out of her sour little mouth but the worst she does here is call him Spanky in front of his students. So Homer and Principal Seymour Skinner pawn Bart off on the French. Now there are lots of different French stereotypes the show could have employed and the writers deserve credit for not taking the easy road and depicting the French as effete, Jerry Lewis-loving snobs. No, they went a more rural route and put Bart in the questionable care of a pair of uneducated, greedy, semi-feral French farmers who sign up for the foreign exchange program so they can find an indentured servant who will work the fields and dedicate himself to slave labor so that the farmers' beloved mule Maurice can finally have some well-deserved rest. 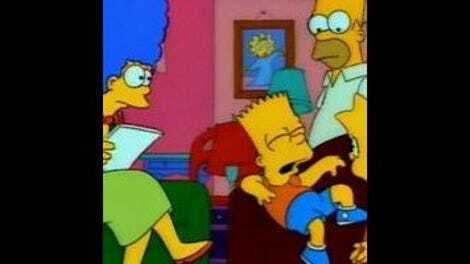 Thus begins a season in hell for Bart, who trades in pranks and mischief for back-breaking labor, bitter cold and the looming threat of being worked to death. Ah, but Bart is more resilient than he imagines and finally musters up the courage to confront a gendarmerie and tell him the ugly realities of his situation. The officer could care less about Bart’s suffering but is horrified by the news that the farmers fortify their wine with anti-freeze. All of this is, as you perhaps remember, hilarious but the B story is just as brilliant. It’s almost a shame The Simpsons had to begin after the end of the Cold War because it’s take on the battle between capitalism and Communism was always hilarious. Today’s episode is no exception. The Simpsons are afflicted with Edil, an adorable little brown-noser from Albania who also happens to be a very skilled veteran spy who just can’t wait to visit the power plant and learn as many national defense secrets as he possibly can. Today’s episode ends on a perfect note of world-weariness as Edil meets a young/new adversary during a prisoner swap and they reflect that they might be getting too old for the dirty business of international intrigue. With “Crepes of Wrath” the show shifted its focus from a family and a town that both serve as microsms of our complex and contradictory society and expanded its scope to a big, beautiful world just waiting to be Simpsonized. —“Don’t mess up France the way you’ve messed up your room. —Is Albania’s main export still furious political thought?